EMCORE Corporation has introduced a new series of precision, single-axis Fiber Optic Gyroscope (FOG) modules. The new EMCORE-HawkeyeTM EG-120 and EG-200 models will deliver the industry’s best Size, Weight and Power (SWaP) compared to competing products. 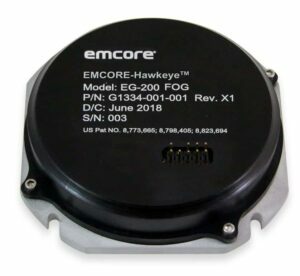 The EMCORE-HawkeyeTM EG-120 FOG module is an ultra-compact, state-of-the-art design that is the smallest, most affordable closed-loop FOG available on the market today. It is approximately 1/2 the weight with 1/3 the power requirements of current generation FOGs and is 35% smaller than EMCORE’s previous generation EMP series FOGs. The EMCORE-HawkeyeTM EG-120 incorporates advanced, next-generation Field Programmable Gate Array (FPGA) electronics that deliver increased performance and reliability combined with low cost. The model EG-200 shares these advanced electronics with the EG-120, but with even greater performance capabilities compared to the EG-120 and the EMP series.